Kilmarnock have signed left-back Iain Campbell from Scottish Premier League rivals Dunfermline Athletic. The 21-year-old has agreed a two-year deal at Rugby Park and will provide back-up for first choice Garry Hay. "We took a wee chance on him and he hasn't cost us a lot of money," Killie manager Jim Jefferies told BBC Sport. "I needed cover on the left and it's a good challenge for him to keep others on their toes and be pressing for a regular place in the team." 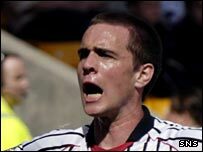 Campbell, a product of Dunfermline's youth system, made 36 first-team appearances for the Fife side. But he has played just once this season, as a substitute in Saturday's defeat by Aberdeen, despite Dunfermline's severe injury problems.